Hi all! Welcome to the YNS DT Dare post! This time, our challenge was to use at least 3 gumdrops, 2 dies and 1 stamp. For my card, I colored up one of the Dinos from the Dino-Mite set. Seriously, one of the new favorite sets! I also used the matching dies to cut him out. 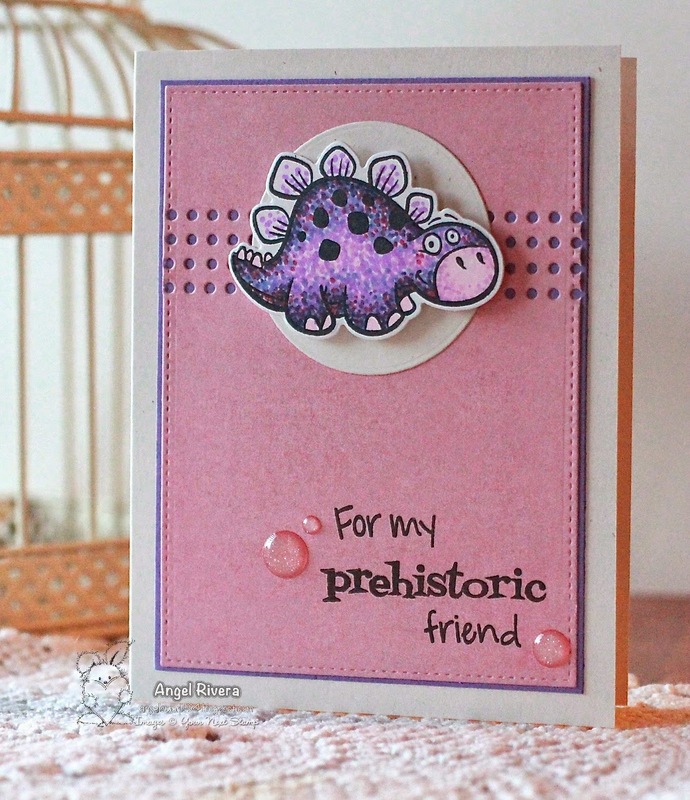 To make him pop, I used one of the circles from the Circles Die Set to layer behind my dotted dino. I used an older sketch from the challenges on SCS except instead of a card stock layer, I used the Stitching Holes die set behind the main image. A trio of sparkly pink gumdrops draw your eye to the fun sentiment. Thanks for stopping by! Don't forget to stop by the YNS Blog to see more inspiration AND comment for your chance to win a SET of your choice! wow, your coloring is so fabulous, I love this!